Performance of the phad begins in the evening i.e. after sunset and dinner. 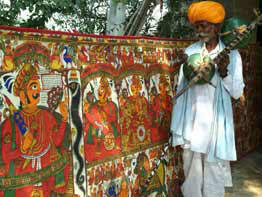 the Bhopa cleans the ground, sprinkles water over it and touches it with a piece of gold to make the ground holy.Before starting the actual performance, the Bhopa places a pat (a small wooden table) before the phad, and puts a Thal (metal plate) on it with a conch and a lighted lamp therein. Thereafter he burns in cense-sticks and starts the performance. 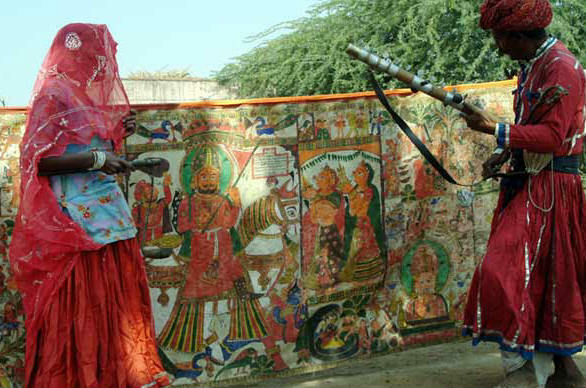 The Patvi Bhopa wears red Baga (a skirt), red Safa (turban) with red Bagatari (shirt).He also ties ghungrus (a foot-ring of small jingling bells) around his ankles and hangs Jantar in his neck. The Diyala-Bhopa, the assistant, who wears ordinary cloths, keeps burning lamp in his hand during the performance. After making all the arrangements for the performance the Patvi Bhopa begins to sing lura hymns to Devji. 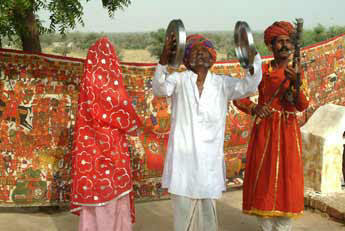 Throughout the night the Bhopa would sing the ballads and dance to the tune of his jantar. He narrates the folk epic on the basis of phad paintings to the audience adding explanations and even improvising innovations. Each scene comes to life as the narration gains and momentum and the assistant with the lamp illuminates it. As the night fades into twilight, the last lura (recitation) is sung, the Prasad (offering) is distributed among the onlookers and the phad is rolled up. When a phad becomes worn-out and unserviceable it is cast – off, with appropriate ceremonies, into the sacred lake of Pushkar which is supposed to be the abode of Brahma. This ceremony is also known as Thandi Karana.